Rosharon, TX–Unsatisfied with the 14-person record they set in December 2013, Skydivers Over Sixty (years of age) returned to Skydive Spaceland in Rosharon, Texas, to set another state large-formation record on May 3. 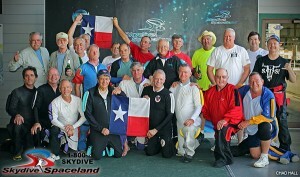 This was the group’s third attempt at building the largest skydiving formation comprised of only skydivers aged 60 and older over Texas; weather kept everyone on the ground at their second attempt in March. Twenty-one skydivers aged 60-78 years old headed for the sky over Skydive Spaceland in two airplanes flying in tight formation–a Shorts Skyvan and a DeHavilland Super Twin Otter. The event organizer was Rick Poplinger and the jump captain was Henry Butler, who has been involved with several record attempts in other categories as well. “[Butler] was happy as only two jumpers lost their dentures in freefall!” joked Poplinger. It took the crew six jumps to set the record. 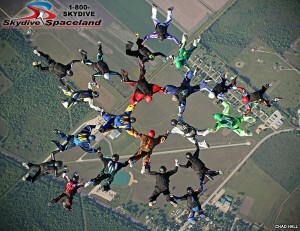 They started with 27 jumpers who had a total of 100,000 jumps and over 1,000 years of parachuting history between them. Once the group was pared down to 21 jumpers, they quickly completed the modified Texas star formation and flew it well, holding onto their friends at 120 mph for nearly 25 seconds. Skydive Spaceland has also played host to the world’s largest skydiving competition, the United Parachuting Association National Skydiving Championships (2009), as well as several other large competitions including the U.S. National Collegiate Parachuting Championships and multiple U.S. National Canopy Piloting Championships. 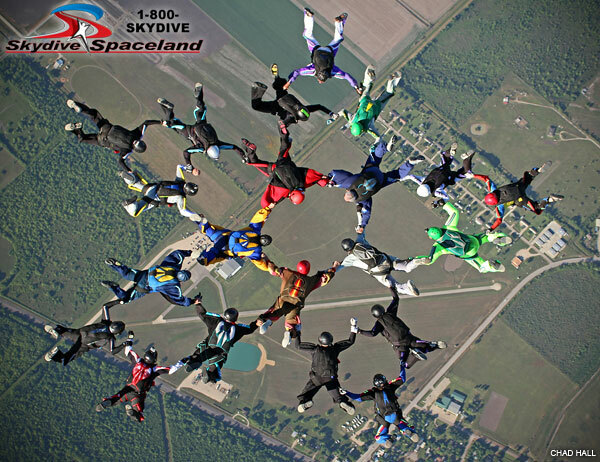 Several state, national, and world skydiving records have also been set at Spaceland including the Texas State Record 150-person skydive in 2007, 168-person skydive in 2011, 4-person formation skydiving (longest sequence) in 2009, canopy piloting speed and distance in 2009, and multiple Women’s Texas State Record skydives held jointly as fundraisers for Jump for the Rose, a Houston-area breast cancer clinic.